would give you more blend time a good idea. For a fact tho you have captured the moment, shown the emotion. THat is just wonderful. Do you guys mean my painting/drawing? I thought it was so bad it killed the thread. If you did in fact mean it about mine.. thanks. I will. Okay, that is weird. The guy's post disappeared. That ad no one has anythign to share - COME ON guys, you have to be working on something! Okay, I do! Smkie, I spent an hour drawing kittens today and this is what I have. 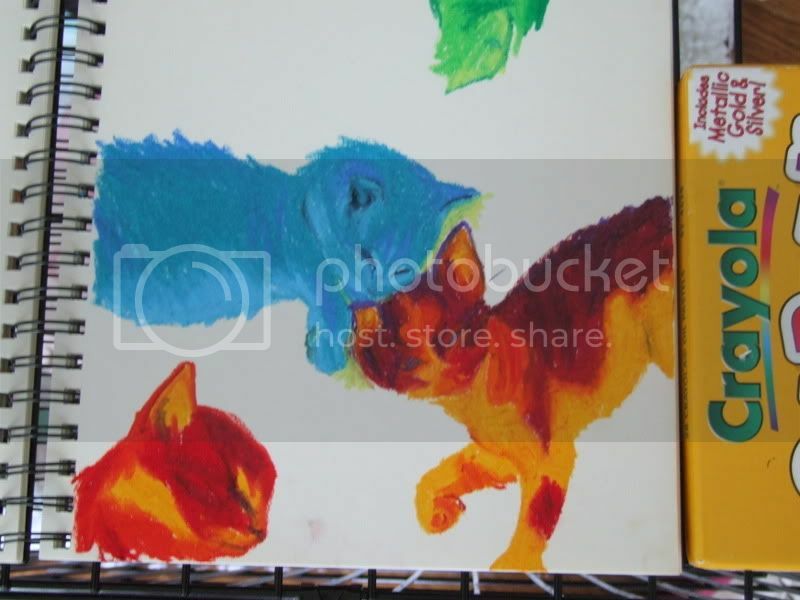 Everythign I do in pastels in a small size comes out looking very.. child-like and un-detailed. But I like the color, at least. Nolan is much more blue in person. Very quick (and kinda messy, heh) sketch I did of Firali, one of my RP characters. Nolo those are just sweeeeet! i honestly forgot all about this thread, my mind is so cluttered lately. RD very nice indeed, hair is tricky and a lot of people have trouble with it. You did a very nice profile. I am soooo bad at hair. =( I know you're supposed to draw the absence of hair or something like that, but I try that and still wind up sucking! LOL. My old boss would lean over and tell me to squint my eyes...so you can just barely see the light and dark and draw in only that. It helped me. I got an example let me go see if i can find it. geez i can't find the one i want. I use to be proud of this drawing now years later i look at it and see everything i did wrong..to modeled, a little overworked, but hey the hair on the front legs still works...that is kind of what i mean. Don't draw what you know is there, but the spaces inbetween paying attention to the shadows letting the shine be known by abscense of hair lines. IF that makes any sense. IF i ever run across the one i am thinking of, it is the best i ever did but i give up. It is lost in my documents forever i guess. Hudson, an adorable English Springer, done for a good friend for Christmas. That is so cool! I want to get back into drawing but unfortunately I left all my art supplies at school. I'm going back there in a week or two to pick them up though so I can finish my pics. In the mean time, Josie (my 10 year old sister) really really wanted me to draw a pokemon for her. I came up with this lol! Okay, I'll admit. It was fun. Great Action!!!! I bet your sister was thrilled! Oh, that is cool! I love how you've incorporated it all. Aw, and what a cute picture of Hudson, too!!! Love it! I always find I have had enough of winter by February !